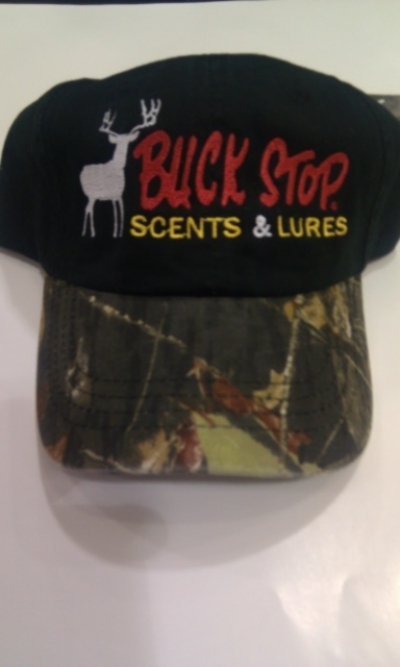 Buck Stop Lure Co has introduced its new SCENT STOP® scent eliminating products at the 2012 Archery Trade Show in Columbus OH. Unscented Scent Eliminator spray and a Scent Eliminator spray with “DIRT” essence. The new products feature more ergonomic bottles, improved formulas, new graphics, standardized sizes of 16 ounce sprays and 20 ounce squeeze bottles, tamper proof caps. Buck Stop President Brian Johansen announced that company had added a number of top industry professionals to the Buck Stop Pro-Staff along with several key staff members. The Pro-Staff adds a new dimension to Buck Stop’s marketing and sales team with more television and DVD exposure as well as working dealer and sport show events. According to Buck Stop President Brian Johansen, these guys and gals are passionate about hunting and using products that they believe in. They do a tremendous amount of work with young hunters, bringing them in to the sport and installing the values that hunters hold dear. The mentoring that the Pro-Staff members put forth is a positive reflection on the hunting community as whole and vital to the future of our sport. I have 25 limited edition hats for sale $20 ea you get a FREE window decal along with FREE shipping. To get this special call 800-477-2368. Michigan's deer herd is in full rut as of this report. This past week has seen lots of big bucks taken, and many more seen. Calling and scents have been the hot methods to use. The weekend of the 13th-14th should be a great time to be in the woods bowhunting. Lots of gun hunters will be making last minute scouting and blind preparations which will have deer moving. The gun opener on the 15th should still find bucks chasing does as the rut starts to wind down. We at Buck Stop wish you all a safe and successful hunting season. I am often asked the question of when is the best time to "RATTLE" for whitetail bucks. I have rattled in bucks from September through January. The style of rattling is largely dependent on the phase of the rut at the given time. Some of my best rattling experiences have been the first week of October in Michigan. I have successfully rattled in bucks in Canada, Texas, Mexico, Ohio as well. In my 30 plus years of rattling whitetails I have learned some tricks that work year after year. Some of these tricks just might work for you too. Things to remember, deer have 3 important senses that they use the most, smell, hearing and sight. More often than not you need to trigger 2 of the senses to get either a positive or negative response. Trigger either sight or hearing and the deer will use its sense of smell to reinforce its other senses. So it makes sense to be as scent free as possible, and the use of an attractant scent as well. Use non-rutting buck urine during the early pre-rut period. Buck Stops Guide Grade Scents #GG150 or Supreme buck urine #1502 are good choices. During this pre-rut period bucks have shed their velvet and are establishing the pecking order. These early season rattling sessions are a soft tine tickling affair. I have had my best success in rattling in grassy fields about 45 minutes after daylight and the last 90 minutes of daylight. Most of my sessions are done "BLIND" meaning I have no deer in sight. I lightly click the antler tines together for 10-15 seconds pause a couple seconds and start over again for another 10-15 seconds. I will repeat this of up to 5 minutes. I am always scanning the area for movement. Lots of times a buck will respond before you finish the sequence. You will see manly 1 1/2 years bucks during this pre-rut period. The peak rut period requires a different approach you will need to be more aggressive and louder in your rattling sessions. I tend to move in to the woods and wood lines during this period, I also start using the estrus doe urines like the very popular 200 Proof #1401. Hot scrape area are a prime setup spot during the rut. I will always start a semi light blind rattle just before daylight unless I can hear deer moving nearby. If I have not seen any movement after the first 30 minute of daylight I will launch in to an aggressive "LOUD" rattling session. These sessions will last 2-3 minutes, a few rutting grunts from your favorite grunt call helps as well. I will repeat the sessions every 30 minutes or so. I often issue a series of grunts between sessions. This is the period when I rattle in my biggest bucks. Rattling when you have a buck in sight is a hit or miss thing for me. I will just click the antler together just loud enough for him to hear them, you then have to play off of the way he acts. Grunt calls really help during this situation. If he shows no interest I will rattle once after I no long see him, and then play the waiting game. In the morning wait at least 1 hour after you have seen a good buck leave, they tend to sneak back in from downwind. Play your cards right and you just may shoot a buck of a life time. I always want a buck to know where I am hunting at. I just don't want the buck to know what I am. This is where Buck Stop's scents come in to play. Fooling his nose is 3/4 of the battle. Advanced methods include using a decoy or two near a hot scrape. I only use this method a couple times a year where I place a standing buck over a bedded doe, with the use of scents, grunts calls and rattling antlers. I normally use this when I start see big bucks moving during the day searching out does. NOTE: Never use this method during gun season. Good luck this season. Put a little noise in to your hunt. For years successful hunters have know that using a mock-scrape system has increased buck sightings during hunting season. Now that mid-september has arrived its high time to get the scrape lines set up. Mature bucks will visit old scrapes year round. As a buck ages or as bucks are removed from the herd, territories change. We all know of a spot where scrapes appear every year, these are prime areas to set up a mock-scrape line. There are several benifits to setting up mock-scrape lines, one is that they help deteriman where to place a stand, another is that it will start natrual scraping earlier in your hunting area. These mock-scrapes are perfect for a trail camera setup to look at age class of bucks visiting your mock-scrapes. Check your hunting area for last years scrapes, field edges, wood lines or any change in what I call a boarder be it a swamp, a two track road in the woods, or any other features that break up the natural terrain are great places to check for old scrapes. Once you find a old scrape, you are in the right area to set up your mock-scrape. You can just re-freshen up the old scrape for starters by removing all ground litter such as leaves, branches, grass tuffs. Place one of Buck Stop's non-rutting buck urine's, in the scrape add several drops of urine to the overhanging branch. Next look for a over hanging branch 4-6 foot high with in 30 yards of the old scrape. Scrape up the ground under this branch, you can use a rake branch or rattling antlers to do this. Set 3-4 mock-scrapes in a line. Check and refresh as needed. It is not uncommon to only have only 1-2 of the scrapes activated. These active scrapes are prime place to hunt. Once the rut kicks in and you find a hot scrape place a mock-scrape with in a deers visual range of the natural scrape. 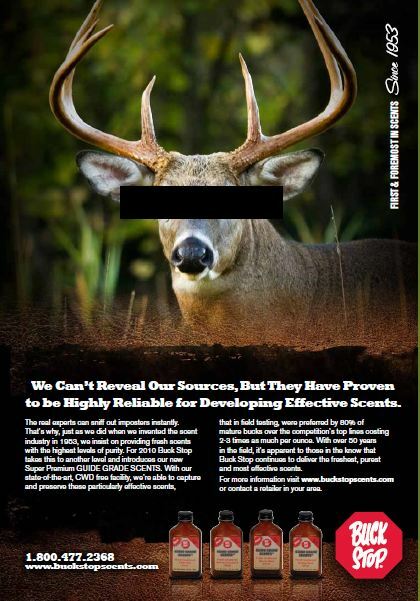 Use one of Buck Stop's rutting buck urine's along with one of our estrus urine's. Leave the natural scrape alone and just re-freshen the mock-scrape. This method is deadly. Products that work for mock-scrapes. Guide Grade Scents, 200 Proof, Ruck'N Buck, Surpreme Buck, Mate-Triks. These scents can be found in the store section of this website. The NEW Buck Stop ad, you get to see it here first. Pre-season scouting is the perfect time to find out what kind of bucks are in your hunting area. The bucks will be in their bachelor groups at this time. They will be feeding at all times during the day. Scouting cameras are a great tools to use for scouting as well. When out scouting it pays to use a good cover scent like Red Fox urine #1011 or our new Guide Grade Scents Calm Doe urine # GG109, these scents will cover your human scent. I always use a scent elimintor while I am scouting. Scent Stop # 1021-4D is a great choice. July is a great time to freshen up last years scrapes just add 10-12 drops of our Guide Grade Scents GG151 Non-rutting buck urine to the scrape, re-freshen about once a week. These will be the first scrapes that bucks open up as the rut heats up. Working and refreshing these scrapes will program the bucks to visit these scrapes frequently. Buck Stop has launched its new facebook page. You can find use with the search bar. Post your comments on our page. We at Buck Stop have been busy updating the product information on the website to help our customers. Feel free to e-mail me at info@buckstopscents with any comments. Buck Stop teams up with TOG Outdoors. Buck Stop President Brian Johansen announces the partnership. TOG brings a strong family value to it videos. Buck Stop and TOG strongly believe that we need to get our children outdoors and hunting can be a big part of spending time in the field with them. Buck Stop and TOG will be working closely with each other to produce quality family videos. BUCK STOP LURE CO America’s oldest family owned hunting scent company is proud to announce the hiring of TACKETT BROTHERS of Richardson TX to represent the Buck Stop product line. Tackett Brothers is a manufactures representative group specializing in the sale of Hunting, Fishing and Outdoor products. Founded in 1989 and built by individuals who love the competitive nature of the sporting goods business, Tackett Brothers represents a limited number of companies to a broad range of customers across the South and Mid-Central United States. They have a wide range of experience in the Scent Industry and are pleased to be joining the Buck Stop Team as representatives in the TALO states. Buck Stop is thrilled to be working with the zeal, professionalism, and experience that the Tackett Brothers group brings on board, states Buck Stop President Brian Johansen. We look forward to working closely with Tackett Brothers in expanding the product line and Buck Stop brand in the TALO states. Welcome to the NEW Buck Stop Website. Our new site is packed with new features, NEW products. Please feel feel to browes the site. Email me your trophy photos and I will insert them in to our photo gallery. Hope you had a successful 2009 hunting season.